It’s what we (need to) do with our old pictures every now and then when the cold and wet weather keeps us from heading outdoors to capture new images to add to our collection… Or when we’re just feeling lazy and feel like staying in. We also need new, updated content for our gallery here so it’s been nice to stay home for a while and keep to ourselves. Looking through our old pictures reminds us where we came from and they give us a fresh perspective on how far the two of us have grown with our photography. Plus there’s always something ‘new’ you can find in a picture each time you see it, especially when you utilize new post-editing process techniques you pick up along the way. 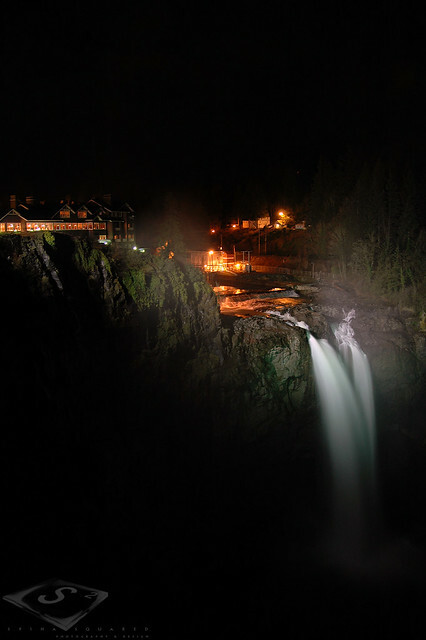 The image to the left (click for a larger view) is of Snoqualmie Falls and was taken in March of 2009, just after a group of us from our car club got together and went up for an impromptu night drive. The windy back roads up to the park make for a thrilling ride, especially in the dark! If you’ve never been, the falls are a short walk from the parking lot and a must-see if you’re in the area, both day and night. The picture below was taken during one of our walks that landed us inside the new Seattle Public Library in September, 2006. American Contemporary Artist Ann Hamilton’s “Floor of Babble” located on the 1st floor caught our attention and the focus of our lens. The architecture within the Seattle Public Library is incredible so even if you’re not there to read books, stop in and check it out. Just remember to keep quiet! We apparently covered a good amount of ground that day as the pictures show we ended up near Seattle Center, the EMP, and the Space Needle before sun down. It was a good day of quality time together and urban exploration. Ocean Shores, WA is where we spent our first Valentine’s Day, a result of another impromptu drive that has since turned to tradition. The picture above was taken in 2009 on the weekend of our one year engagement anniversary. Our ties to a small little island in the Far East Pacific will continue to bring us back to this location to catch the familiar smell of salt in the air and the sounds of the ocean to remind us where we came from. Reminiscing is fun, and the revival of our old pictures is the perfect way to go about it. But the sun is out today… Maybe it’s time to quit being lazy and head out to snap some new pictures. I remember that night drive. Good times were had.